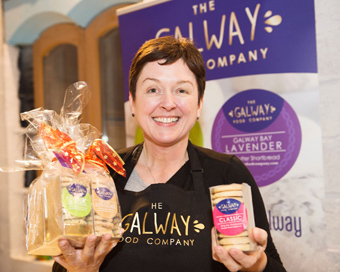 In the hot seat for February’s Women Who Launch is Clare Colohan, The Galway Food Company. Based in Loughrea, Co Galway, I founded The Galway Food Company in the summer of 2015. Our first product range of All Butter Shortbread was launched to market in November 2015 with Connemara Seaweed, Galway Bay Lavender, Rich Chocolate and Classic Varieties. Production is outsourced locally. The vision is to establish the company as a nationally and internationally recognised brand of food products using locally sourced ingredients from Galway. Loans from family and friends to date. Currently looking at investment opportunities. ABC1, those who value high quality produce. Tourist and gift sector. Export potential especially through diaspora channels. Avoca – for their design concepts and Liz Earle Wellbeing – for branding. Awarded runner-up in the SCCUL Enterprise Awards in Galway in January 2016. I have been at home with my seven kids (aged 3-19) for over 15 years. Adjusting to a new routine has been a bit of a “slap” – but we are all getting used to it! We are looking at the lowest cost, most effective ways to grow our market profile and establish our brand values. We launched our website www.thegalwayfoodcompany.com at the end of 2015. We are active on Twitter @thegalwayfoodco and Facebook as The Galway Food Company. We are continually developing creative new recipes and in new product development mode! Definitely the family business model. I am convinced that strong family businesses are the building blocks of successful economies. Trust and openness are vital. My dad taught us all how to run a business. My brother Martin (Sales and Marketing) and sister-in-law Catherine (Finance) are the core members of the team. The kids have all contributed – from concept to design to new recipes to merchandising and selling at exhibitions – they are so talented and creative. It is great learning for them to experience all aspects of the business from start-up stage. They have such entrepreneurial spirit and I am so proud of them all! Have the next three new products developed now! Take the whole family to a villa in Italy for a month! Worst – Getting life/work balance right, talking too quickly! Paula Fitzsimons of Fitzsimons Consulting – I am currently participating in the Acorns Programme for Female Entrepreneurs in Rural Ireland run by Paula. I am inspired by her business acumen, entrepreneurial spirit and positivity. Don’t wait for it to be perfect…just do it! Be your best authentic self. Never underestimate your abilities. Enjoy the journey and don’t forget to laugh!